Speed ZX-Twin Galaxy S7 Edge is a dual SIM card adapter case for the Android smartphone Samsung Galaxy S7 Edge. You install and use two SIM cards (nano SIM size) on your Samsung Galaxy S7 Edge mobile phone. Call, send and receive your SMS/MMS, access Internet/data with your 2 SIM cards on one and unique Galaxy S7 Edge. 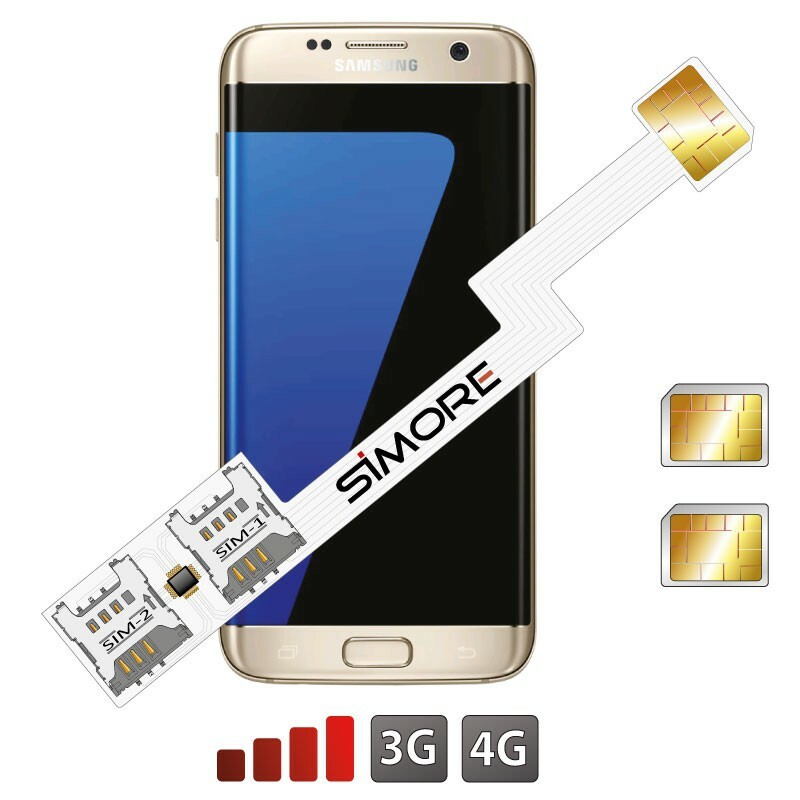 For Speed ZX-Twin Galaxy S7 Edge dual SIM adapter, SIMore creates an innovative and unique design for a simple and easy installation. Together with the latest flexible printed circuit board technologies (Polyimide kapton) that ensure thinness and strength, the new Speed ZX-Twin Galaxy S7 Edge dual SIM adapter design allows, in addition to reinforce the device's membrane, to secure a perfect connection between the SIM cards and your mobile phone. The Speed ZX-Twin Galaxy S7 Edge adapter includes the new Super Speed microprocessor that allows ultra fast switch between your 2 phone numbers. The Dual SIM card adapter Speed ZX-Twin Galaxy S7 Edge includes the shortcut function. The Dual SIM Speed ZX-Twin Galaxy S7 Edge adapter allows to name your SIM cards to know which phone number is connected and avoid roaming fees. With this ergonomic dual SIM case, your Samsung Galaxy S7 Edge is fully protected while keeping all its available features (buttons, connectors and camera of your cell phone). If you have a Dual SIM Galaxy S7 Edge and want it dual SIM as well as having an SD card then this is the perfect solution, you can put our adapter reader under the SD card and then put your second SIM card on the end of the adapter which goes around the back of the phone. Integrate and use 2 phone numbers on your Samsung Galaxy S7 Edge Android smartphone. Convert single SIM Galaxy S7 Edge into a dual sim card Galaxy S7 Edge. Convert dual SIM Galaxy S7 Edge into a triple sim card Galaxy S7 Edge.